Kinda disappointingly, there's no great or even interesting story behind why the famed Huy Fong brand of sriracha sauce is also called "rooster sauce." it's just because they have a rooster on the bottle. Why? Who knows. Why is there a lemur on one of my favorite teas? Does it matter? probably not. But here's a cool tidbit I found: Huy Fong sells over 20 million bottles of sriracha sauce every year. Their advertising budget: $0. Sweet, spicy profit. Cha-ching! 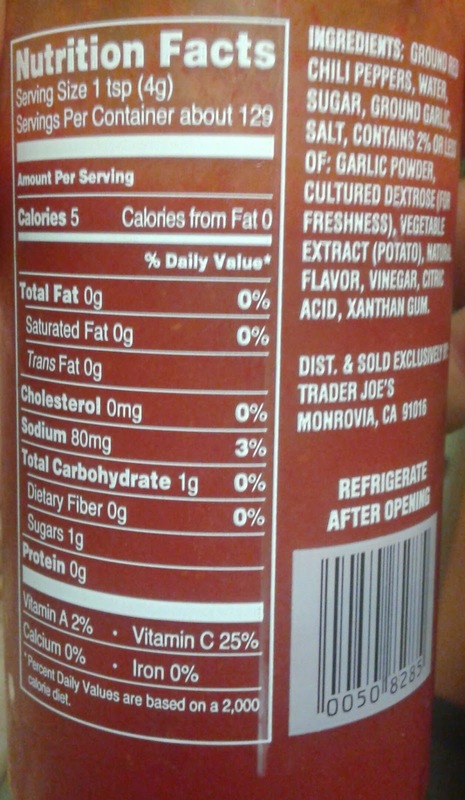 So, there's no rooster on Trader Joe's Sriracha Sauce. Can't call it rooster sauce then. But there's a dragon, so...dragon sauce? I don't know. Sounds kinda lame. But better than an alternate name for rooster sauce that I'd rather not type out for fear of sounding too crude. We try to be family friendly here. Anyways, the animal decoration of choice isn't the only difference between the typical and the TJ's version. First things first, there's the consistency. Not that sriracha is generally all that chunky, but there's is a micro-chunkiness to it, in some ways. Not TJ's. It's as smooooooooth as a freshly greased Justin Timberlake. No glop. No plop. It just squeezes right out of the bottle when provoked and doesn't even make that awful gassy sound that make me hate squeeze bottles. I'm not sure if the texural difference is an overall plus or minus, but the lack of farty noises when trying to enjoy my dinner is an absolute plus. Then there's also the taste. Maybe I've dabbled too much in the sriracha-derived condiment world to remember what sriracha actually, truly tastes like in an unadulterated state, but...this stuff tastes sweet. Like, really sweet. Don't get me wrong, there's a good chile wallop that can be sinus-clearing worthy but...I taste a lot of sugar too. With sugar being a key ingredient in fermentation, and fermentation being one of the main steps for sriracha production, I'm thinking that perhaps there's something different going on here, but I can't quite figure it out what it exactly would be. Maybe it's a fume-free process - the factory neighbors would be grateful. Don't know. Still, there's enough here to like overall. I've paired the sriracha with grilled chicken wings, eggs, sweet potatoes...all with good results. Sandy mixed some up with soy sauce, garlic, brown sugar, and probably another ingredient or two for a shrimp and broccoli stirfry the other night that was deeeeeeelicious. Good taste, with good flavor profile, just a little extra sweet with the heat. I will add that the following day after ingestion, there have been some mild digestive side effects that I will not elaborate on (yet again in fear of sounding crude). I will instead invite you to listen to this classic tune by Johnny Cash. 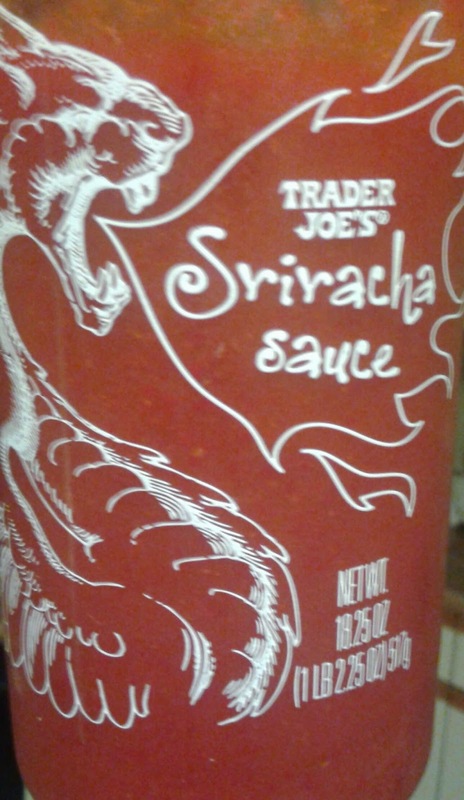 Anyways, for no more than a coupe bucks for the bottle, this sriracha was a good buy which will be repeated. This sauce is different from the original but still good (although my g prefers the original!). For a tasty dipping sauce, mix this with plain yogurt (or sour cream). Great on burgers, dumplings, etc. The creator (David Tran - of Vietnamese and Chinese descent) was born in the year of the Rooster. The name Huy Fong is hommage to the ship (carrying the same name but spelled Huey Fong) on which he fled communist Vietnam.